Daylight Savings Time ends Sunday morning at 2:00 a.m. - which means you'll turn your clocks back and gain an hour to your day. 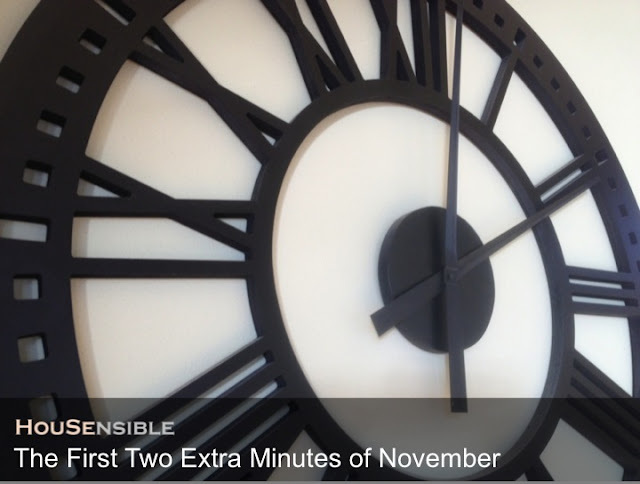 While some people (mostly those under the age of 20) have the luxury to apply this extra hour to sleep, for most of us, it really is an extra hour to get work done. With an ever-growing jobs list, I'm thankful (since this is the month for Thanks) to have all 60 minutes of it. I like to use my first extra minute (actually 30 seconds) of November to check my smoke detectors. Did you know that most residential fires occur during the winter months? Now I don't know about you but it seems to me that a 30-second task that potentially equals a life or lives saved is the best insurance deal you could hope for. No excuses...go check your detectors and replace the battery if necessary. 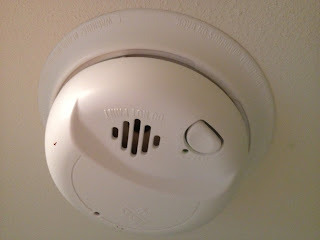 Right after testing my smoke detectors (and since I already have the step stool out) I've made it a habit in my second extra minute of November to change the direction of the spin of my ceiling fans. This is by far the easiest job on my chore list and gives big and immediate payback in energy savings, comfort and chi. In summer, your fans should turn in a counter-clockwise - or forward - direction (as you stand under it and look up). This pushes the air downward giving a "wind chill" effect in the room. In winter, you'll want to reverse the direction to clockwise so that the rising warm air trapped at the ceiling gets circulated to the walls and back down into the room. Be sure to keep the fan speed on low in the winter otherwise you'll again create a wind chill which is not good in the winter. Summer - Forward, or counter-clockwise: Downward air movement makes a "wind chill" effect. Winter - Reverse, or clockwise on low speed: Recirculates warm air trapped at ceiling back into room. Note: An exception to this rule is if your fan is on a very high ceiling. You should then keep the fan set in the forward spinning direction. Turn your ceiling fan off. Find the switch on your fan's motor housing. Turn your ceiling fan on. Comfort, savings and moving air (chi) with the flip of a switch. Check, check and check.